Los Angeles, March 16, 2019. Los Angeles — During an event-packed weekend in this sprawling Southern California metropolis, people took to the streets for Bolivarian Venezuela, attended an informative conference on socialism, and revolutionary activists from across the U.S. launched a new organization to unite workers and oppressed people in the struggle against capitalism: the Socialist Unity Party. March 16 was a day of international solidarity with the people and government of Venezuela, who continue to resist economic sanctions, political sabotage and military threats from Washington and its allies. 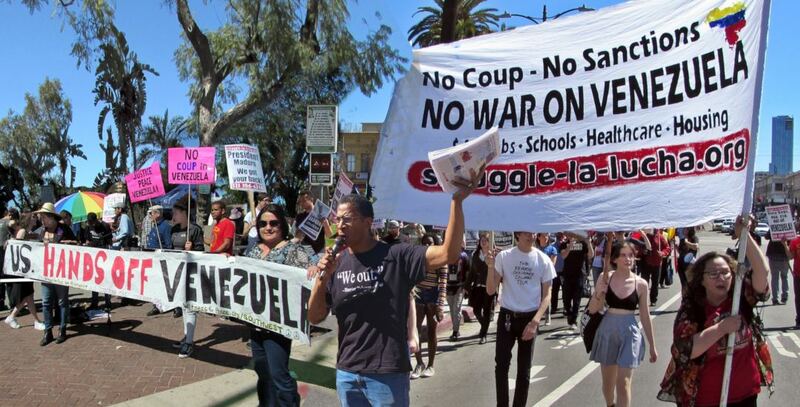 That morning, at least 100 people gathered at MacArthur Park in the heart of a Latinx neighborhood to demand “Hands Off Venezuela!” — a protest initiated by Struggle for Socialism-La Lucha por el Socialismo and sponsored by a coalition of 17 organizations. Fact sheets in Spanish and English were handed out to passersby, describing the work that Bolivarian Venezuela has done to lift people out of poverty and contrasting President Nicolas Maduro — a former bus operator and union organizer — with billionaire white supremacist Donald Trump. Chanting “No blood for oil — again!” and “Whose streets? Our streets!” protesters seized traffic lanes around the park as they marched toward the office of the Central American Resource Center (CARECEN-LA) for a brief closing rally. 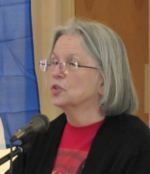 Afterward, organizers invited protesters inside to attend the conference titled “Unity for Socialism and Revolution.” Flags of Venezuela, Cuba, Puerto Rico and Palestine decorated the speakers’ area, along with the red flag of the socialist USSR, the LGBTQ2S liberation flag and others. Volunteers dished up homemade vegetarian chili. 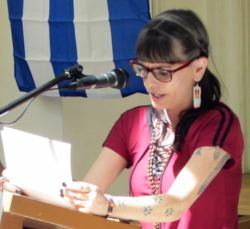 The conference, organized by Struggle-La Lucha, took up “Fighting Global Capitalism,” “Fighting for Socialism” and “Global Solidarity.” Zola Fish, proud member of the Choctaw Nation of Oklahoma and the Leonard Peltier Defense Committee in San Diego, opened the conference by reminding everyone that it took place on stolen land. Fish dedicated the meeting to Indigenous women and the fight for Murdered and Missing Indigenous Women, Girls and Two-Spirit People (MMIWG2S). Struggle-La Lucha’s John Parker set the tone. Reviewing the ongoing global capitalist economic crisis and imperialist wars, Parker declared, “You can’t call yourself a socialist if you help enable U.S. war. If you call yourself a socialist, it means you’re fighting to end capitalism, a system that profits off misery and war. “Many of our different organizations are faced with attacks from the state,” Parker continued, “and from state institutions and universities that try to find every kind of way to negate the science of socialism and the class that will bring it to fruition. They try to take the class question out of all other questions and have us blame each other, not our class enemy. “Destroying the unity of our working class is a danger to all of our class. We must build our class up, not tear it down. We must educate, not eliminate, our family of working people. Other speakers took up the struggles for migrant rights and the Central American refugee caravans at the border, the strikes by teachers in Los Angeles and other parts of the country, the struggle against police terror and in solidarity with prisoners, fighting capitalism’s destruction of the environment and other issues. 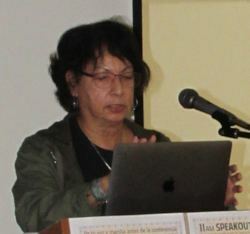 Puerto Rican revolutionary Berta Joubert-Ceci described the takeover of the island nation’s economy by a U.S.-imposed financial control board as a “laboratory experiment [for] a new kind of dictatorship and economic model.” Speaking by teleconference, Mahtowin Munro of United American Indians of New England talked about the importance of Indigenous struggles and decolonization in the struggle for socialism. 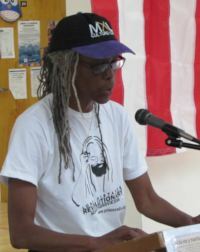 Labor activist Andre Powell emphasized the importance of having a Marxist understanding of the lesbian, gay, bisexual, transgender, queer and two-spirit struggle. 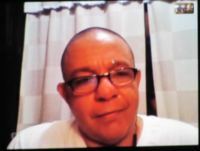 Jesús Rodríguez, editor of Orinoco Tribune and former Venezuelan diplomat, spoke briefly by internet from Caracas. The recent U.S. attack on Venezuela’s electrical grid is comparable only to the oil sabotage of 2002-2003 in severity, he said. Unfortunately, Rodríguez’s presentation was cut short by connection problems resulting from the electrical sabotage. Struggle-La Lucha’s Cheryl LaBash described the key to Cuba’s 60 years of resistance to U.S. imperialism is moving forward through unity, as demonstrated by the recent country-wide discussions leading up to the vote adopting its new constitution. Other speakers took up solidarity with Brazilian teachers, the Philippines, socialist China, People’s Korea and Vietnam, and the anti-fascist struggle in Ukraine and Donbass. A number of international greetings were sent to the conference from workers’ and anti-imperialist organizations from Brazil to Germany, Russia and the Donbass republics. Conference-goers voted unanimously to send a message of solidarity to exiled Palestinian activist Rasmeah Odeh, whose freedom to travel and speak at political events has come under attack by the German government through pressure from the U.S. and Israel. The event concluded with a special presentation and discussion led by Clarence Thomas, a retired leader of the International Longshore and Warehouse Union (ILWU) and co-founder of the Million Worker March movement, who spoke about his experiences in the working-class struggle, from the 1968-1969 San Francisco State College strike led by Black students to the ILWU’s boycott of apartheid South Africa. On March 17, workers from many parts of the U.S. — including Black, Latinx, Asian/Pacific, Indigenous, women, oppressed genders and LGBTQ2S workers — met to found a new organization in the fight against capitalism: the Socialist Unity Party. Together, the group already publishes a bi-weekly newspaper, its website and daily news links plus a monthly radio broadcast. Find archives and more information at Struggle-La-Lucha.org. Follow us on Facebook and Twitter. If you like what we are doing, please donate.